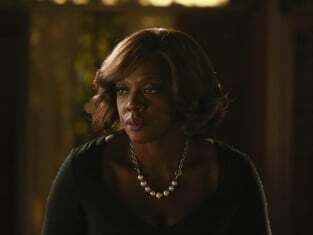 It's sad, but true: We’ve come to the finale of How To Get Away With Murder Season 1. 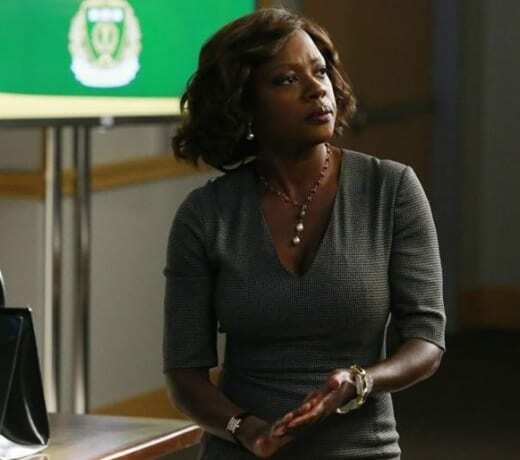 Via back-to-back installments tonight, beginning with How To Get Away With Murder Season 1 Episode 14, we'll learn new information that may implicate Rebecca in the murder of Lila Stangard, which could change how Annalise and her students see Murder Night. There are also many other pieces in play, of course, including Bonnie’s affair with Asher (and the fact that Frank now knows)... Connor’s relationship with Oliver... and how everyone may see their world rocked even more once they find out what really happened to Lila Stangard. 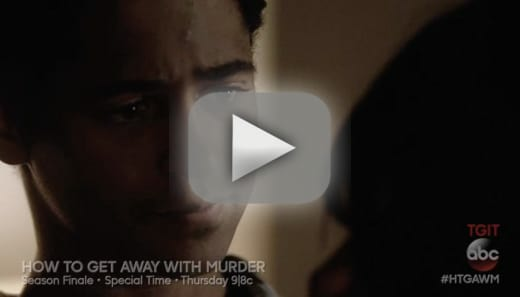 TV Fanatic: In this past episode, we got more insight into characters like Annalise and Bonnie, were these things we needed to know going into the finale? Peter Nowalk: I hope in every episode we’re peeling back the onion layer on each of the characters or giving people more to know about them. I don’t think in that episode, we were specifically like ‘oh we have to get that information out so that the finale makes sense.’ I think t’s more just where we are in the show and having some space to breathe to get to know the characters even though there’s a lot going on. Especially that was true with Annalise and I do want to give credit where credit is due. 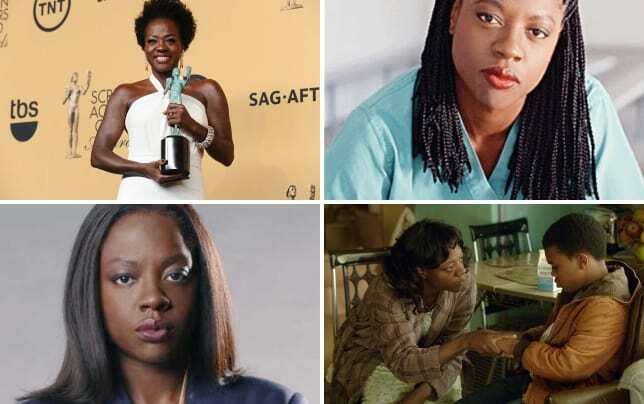 Viola had come to me and said ‘I think we need to meet Annalise’s mother.’ I said, ‘I would love that.’ She said ‘I think Cicely Tyson would be a dream casting.’ And I said ‘Let’s see if we can get her.’ That storyline just really stemmed from this gut feeling that Viola had in order to get to know Annalise and finally get to know something about her childhood and backstory and I really do think she was so right. The audience wants to know more about Annalise at this point. I’m really happy we did it. TVF: I know we’re going to see some new things in the finale. Can you talk about that? PN: We’re going to look at Lila’s murder night and we really haven’t seen anything. We’ve heard about it a lot but we haven’t seen Lila’s murder night and in these two episodes we’re going to flash back to that specific day and night and we’re going to show exactly what happened as our characters are trying to figure out what happened. TVF: Is it safe to say what we find out about Lila’s murder will inform Sam’s murder night more? PN: I think that going into the episode, what we fear is if Sam didn’t kill Lila and Wes was wrong and they were all wrong, were they justified in killing Sam and the answer is no. I think in the most scary way it will blow up everything that they’ve done and the only thing that’s actually kept them able to stand on two feet and not want to kill themselves is that they were justified with killing Sam. It’s a house of cards. TVF: I feel like Wes’s sanity has been very shaky so does this new information shake him up every more? PN: I think we’re going to see him in crisis, for sure. What that looks like I don’t want to reveal but I think he definitely is in a very uncomfortable position and I think he’s scared but also ashamed. I would say the audience should worry about mental state. TVF: Talk to me about Asher a little bit. I feel like he’s been on the outside of things since he wasn’t a part of killing Sam the way others were. What will we see? PN: Asher has an interesting role because he is, as we know, on the outside of things. The immediate question is will his affair with Bonnie be revealed to anyone now that Frank knows and how will Frank react to this? That’s the immediate thing with Asher…he has a lot to do in the finale. TVF: There’s a scene in the last episode with Frank and Bonnie talking about Annalise and it made me think they’re the children to Mama Annalise. Is that really the relationship or do we get more about that dynamic. What will we see moving forward? PN: We’ll delve into that a little bit more. Specifically, Bonnie has given Frank a lot of crap about sleeping with students and specifically getting involved with Laurel. Now that Frank has the knowledge that she is sleeping with a student, that’s going to affect their relationship. Also, I’m glad you noticed that scene because it was a very quiet scene in a very loud episode. They have a brother/sister relationship and they’re also dealing with their younger siblings, the Keating 5. They’re like the older siblings trying to keep it together. TVF: I’m concerned Oliver is going to get pulled in more to things and be in over his head. What will we see with Oliver and Connor in the finale? PN: I will say that Oliver is definitely in the finale. It’s just not going to be in the way that you expect. TVF: And, from the last episode, as hard as I tried, I could not find [the gay hookup app] Humpr online! PN: [laughs] You know what’s so funny about when we came up with that. It was the first thing that came to mind but to clear a name, I thought ‘Someone’s probably taken that’ but it does not exist! TVF: Is there more to Michaela being concerned about Nate being in jail? She explained it to Annalise in the courtroom but is that the end of it? PN: I think that’s just an interesting reveal about Michaela. I think Laurel presented us the bleeding heart but actually turns out to be very hardened and pragmatic about getting away with the murder. I think Michaela is much more emotional and feeling guilty about it. It’s very hard for her to compartmentalize her involvement with ruining an innocent man’s life. I think it just shows how much of a soft soul she really is deep down. She just feels terrible about what they’re doing to Nate and, to me, that felt true to Michaela. I think Nate’s still on trial and in jail and we’re going to be dealing with that in the next two episodes a lot but I think her guilt will be there and continue to be there. TVF: What is season 2 going to look like? Does this story continue or…? PN: We’ll definitely answer a lot of questions and in those answers there might be a few new questions that you’ll want answered in season 2 if we’ve done our job right. For me, I want the story to continue in a real way and not just put the first season away and start fresh in the second season. I think what they did in the first season and how their lives changed, it just gets more and more complicated. There are more and more layers to what can happen to them now. One thing, it’s a ripple effect and we’re going to watch all those ripples and waves hit them, hard. How To Get Away With Murder Season 1 wraps up tonight at 9/8c on ABC.